Look no further than your kitchen. Yes, some real treasure stuff for your hair is in your kitchen. And you may be clueless of it. I am talking about yogurt, honey and olive oil — all common and ordinary ingredients. But they can make your hair extraordinarily beautiful. Yogurt is full of protein, which helps strengthen the hair shaft, making them less prone to damage and split ends. For your scalp health, yogurt has lactic acid. Its gentle cleansing action helps to clear away dead skin cells that gather on your scalp and cause it to become itchy and flaky. Honey helps your hair absorb and restore moisture. And moisturised hair equals soft, silky smooth hair. Honey is also pH balancing and antiseptic, which make it good for your scalp too. Olive oil is a superb hair softener. It’s oleic acids offer great moisturising and conditioning effects. Your hair will be more elastic, so less breakage and easy to comb. Plus the vitamin E and polyphenols in olive oil rejuvenate hair follicles and encourage strong, healthy hair growth. Stir all of the ingredients together until well mixed. You can use this mask right before you shower. Apply the mask to your hair and scalp (you can use it on dry or damp hair). Put on your shower cap or wrap your head in muslin cloth or a towel. Leave this on for 20-30 minutes. Wash as normal and let your hair dry naturally. Do this mask once or twice a month to restore and maintain your hair. Enjoy your soft, shiny hair! Using yogurt: For this mask it’s best to use plain, whole fat or full fat yogurt. Also, prefer yogurt with live cultures, as it has extra benefit for the scalp health. If you make it at home, that is the best. Yogurt substitute: Some hair become rough after using yogurt, so if you are one of them you can replace it with coconut milk. Also, vegans or those of you who avoid dairy can use coconut milk. It offers similar hair benefits as yogurt. Oiled hair: You can apply the mask on oiled hair. Using Honey: Honey has a mild bleaching effect and can lighten your hair over time, but if you use it once a week, you won’t see much difference. Alternatively, use blackstrap molasses, which is superb for those with darker hair. It has high amounts of iron, manganese, magnesium, copper, calcium, potassium, selenium and vitamin B6 – all these nutrients are excellent for your hair. If you have dry hair, use this technique to keep your hair soft, shiny and frizz-free. While your hair is still damp, take a few drops of the oil in the palm of your hand, rub your hands together and work it through your hair, paying attention to the ends. You can use any light oil such as argan, almond or grapeseed; or you can also use butters such as shea. This will lock the moisture into your hair shaft and add plenty of shine and gloss to your hair. Do not wash your hair too much. Once or twice a week is good enough, unless you work out every day or live in a very humid area. Use gentle shampoo, or try this natural cleanser. Hot water is your enemy. Always use cool water on your hair as well as skin (unless you have cold and cough). Let your hair air dry. If you must blow dry, use the cooler setting. Stay away from chemical treatments. Perming, straightening or coloring deplete moisture from your hair and can leave it very dry. Protect your hair from hot sun as it can dehydrate your hair. Wear a scarf or hat when you are spending long time in the sun. Nourish your hair from within. Take omega-3 rich foods such as fish, walnuts, pumpkin seeds, and flax seeds. Omega 3 helps to restore moisture, and improves smoothness and shine of your hair. Vitamin A is also extremely important to keep your hair soft and hydrated. Include foods such as pumpkin, mango, carrot, sweet potato, dark leafy greens, and papaya. 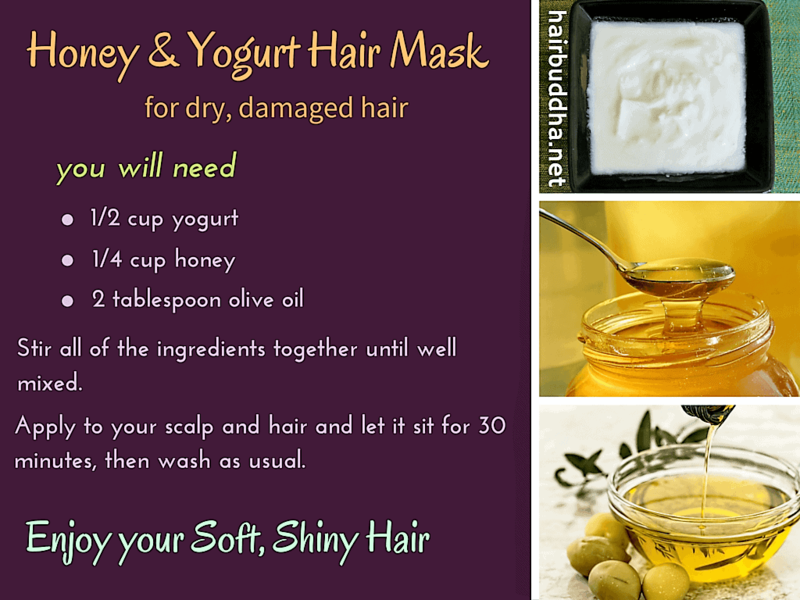 Have you used yogurt and honey hair mask? How do you moisturise your hair? Share below! I am a great follower of your hair buddha website. And since I have grey hair i am using your herbal rinse but in powder form and also add Indigo to the same. It really works and Thank You so much for everything. I wanted to let you know that last week i went to the saloon to trim my hair, and the stylist trimmed my hair and later she ironed my hair which now i feel the ends have been damaged. My hair has become quite rough after the stylist used iron. And also wanted to highlight that i cannot trim my hair anymore as she has already cut until my shoulder. I really need your help on how to repair the damaged hair. I did a yogurt mask yesterday and it was impossible to comb through. The only other ingredient was avocado oil but not much because I didn’t want oily hair afterwards. Xanthan gum is very slippery. Next time I’m going to add that, too. My recipe was 1/3 cup plain whole milk yogurt and 8 drops avocado oil. I think 1/2 tsp xanthan gum will be plenty. Be careful in the shower. This stuff is VERY SLIPPERY! I’m also going to add more yogurt, like 1/2 total since i have long hair and maybe one tablespoon of oil. You can also use coconut milk for yogurt. It adds more slip. Hi, do we expect to see a treated/healthy hair after applying this like immediately? Can I apply this paste after I apply oil? Oh no! You can try coconut milk hair mask. I’ve tried this method and I’m actually having major hair fall issues. I applied it in my hair and waited 30 minutes before I washed it. And since then I’ve lost a major part of volume. Do you think it’s an allergic reaction?? Hi, I wonder why you choose yoghurt which is full of protein for dry hair? Proteins make dry hair coarse so I am curious about your opinion on that. Hi Kasia, It’s a good question. Yogurt has high amount of water and fat content and therefore it doesn’t really cause protein overload. Although in some people it can cause a drag. Love this hair mask! Left my curly hair bouncy and soft ? i have a question, when you mentioned wash hair as normal did you mean to say we need to shampoo our hair once the mask is rinsed out or do we shampoo our hair the next day?? do let me know please..
Hi Kirti, you shampoo after you rinse out the mask. Let us know how it works for you. I really appreciate your concise factual post. I have adopted the thinking, “If it comes from a plant it is good for the body. If it comes out of a plant, not so much.” My modification was avocado oil, the sun protection! I use EVOO in many of my other hair care products I make. I went to visit an elder cousin (only 8 yrs) she said my hair looked great like it did when I was a child. I had done the yogurt honey mask earlier that day. Going to try with the cocoa next time. I’ve been doing Helena mask the last couple months and don’t want indigo. Hi Donnamarie, I totally follow that thinking and it’s done wonders for me. I am gonna try this tomorow.